The post instructs the user to implement the application reads UID code and data of RFID tag according to ISO/IEC 15693 displays LCD using CR95HF Easy board, Arduino UNO Easy SHIELD board of AT-COM and Arduino UNO R3 board. CR95HF Easy is a development board for RFID application which designed and manufactured by AT-COM, support user to implement their RFID application easily. Board is integrated CR95HF transceiver chip has frequency 13.56MHz with antenna is designed direct on PCB, Support ISO/IEC 14443 type A/B, ISO/IEC 15693 and ISO/IEC 18092. CR95HF Easy communicate with microcontroller through UART interface (TXD, RXD), and SPI interface (MISO, MOSI, SCK, CS) on ATCBus Header. Board is designed use 3.3V supply, has power indicator Led, operation with RFID tag or 13.56MHz identification card. Ideal for protected system or tracking need RFID support. CR95HF Easy bring a whole new style of design, Experience the great “Plug and Play" feature with Easy Boards system of AT-COM. Arduino UNO Easy Shield is an extension board for Arduino UNO and the boards compatible with Arduino, Product support 2 ATCBus socket allow the user connect Easy boards with Arduino UNO quickly and easily to implement application as: GSM, GPS, Wifi, Bluetooth...Beside, Shield has support Switch allow load program for Arduino which no need to remove device board on the Shield. Besides that, equivalent size with Arduino UNO, comfortable data output, Arduino UNO Easy Shield bring the subtle inspiration when combined Arduino and Easy board. + Board converts LCD to ATC Bus. + Board converts interface voltage 3V3 to 5V. + RFID ISO/IEC 15693 tag. Because CR95HF Easy is designed to communicate at a voltage of 3V3, Arduino UNO R3 board communicate at a voltage of 5V, so we need add a board converts voltage 3V3 - 5V to CR95HF Easy and Arduino UNO R3 can communicate with each other and board converts LCD to ATCBus to connect LCD 16x2 with Arduino UNO R3. Board converts voltage 3V3 - 5V and board converts LCD to ATCBus at the present not yet product, so the user can according to schematic below to connect on demand. 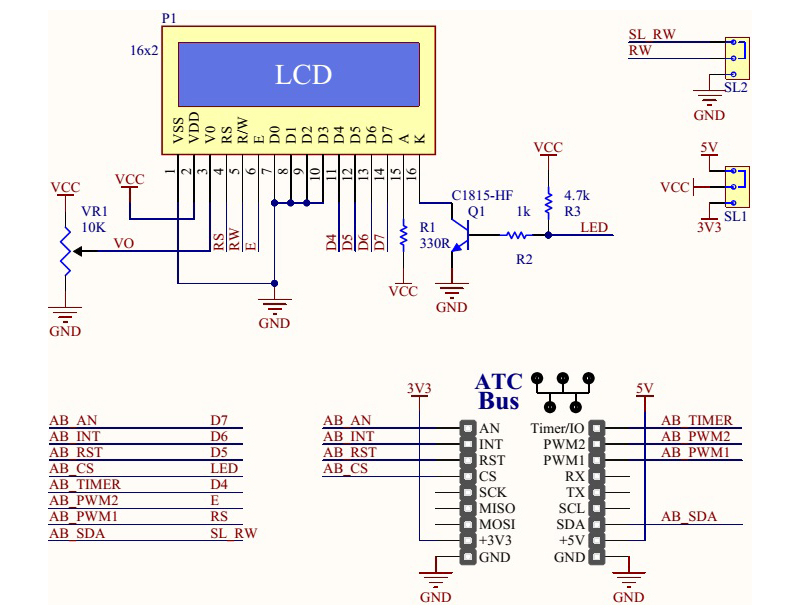 The circuit converts LCD to ATC Bus. The circuit converts voltage 3V3 - 5V. Connect Arduino UNO Easy SHIELD board to Arduino UNO R3 board, connect board converts LCD to ATC Bus to ATC Bus Socket 2, then insert the 16x2 LCD, connect board converts voltage 3V3 - 5V to ATC Bus Socket 1, Connect CR95HF Easy board to board converts votlage. 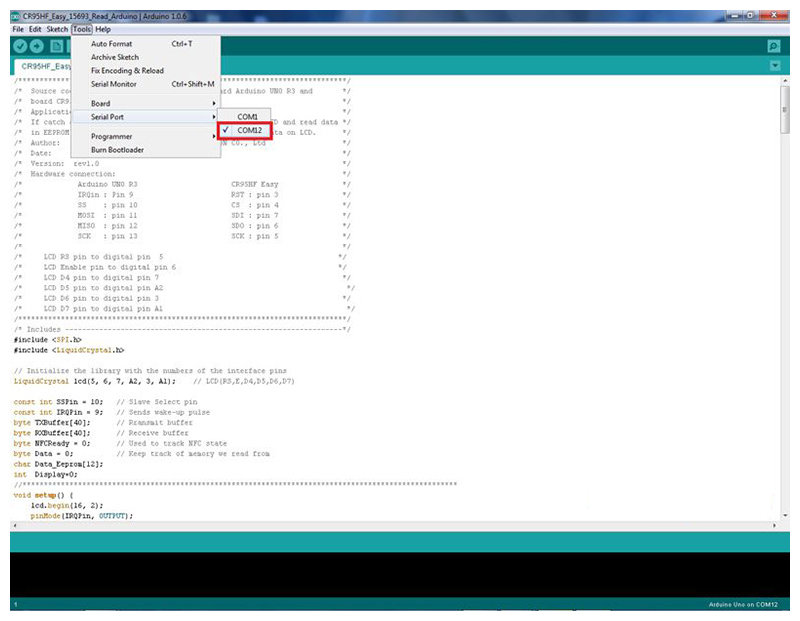 You access to address: http://arduino.vn/bai-viet/68-cai-dat-driver-va-arduino-ide to reference way to setup Driver and Arduino IDE. Connect Arduino board with computer via USB Cable and Open program uses Arduino IDE software. (Setup Driver and Arduino IDE at step 3). Source code shows in the post use programming environment for Arduino is Arduino IDE to compile and load for Arduino board.You can dowload source code in CR95HF Easy product. + After unpacking we open CR95HF_Easy_15693_Read_Arduino.ino file. + On interface Arduino IDE software, we choose Tools -- > Board -- > Arduino Uno. + Choose COM port is connecting Arduino Board with computer: Tools -- > Serial Port -- > COM12 ( Choose COM port is connecting ). + Load program for Arduino Board: File -- > Upload. After load program and config successfully the system will show on LCD: “CR95HF Handled”. When you give ISO/IEC 15693 tag near antenna (distance: 4.5 - 5cm) of CR95HF Easy board, on LCD will show UID code and data of RFID tag (if yes). The application combines STM32F1 Easy and CR95HF Easy of AT-COM.